You’ve finally gotten into PT school. Congrats! Now what? Do you know how to succeed in PT school? Making the transition from undergraduate studies to graduate school is not easy for anyone. While most people expect to spend long hours in the lab and studying for exams, what will set you apart when it comes time to apply for jobs? Everyone who gets the letters PT, DPT behind their name has gotten a high GPA and passed their boards. The major question coming out of PT school is, what comes next? What have you done to set yourself apart other than get good grades and learn how to function in the high stress environment of physical therapy school? 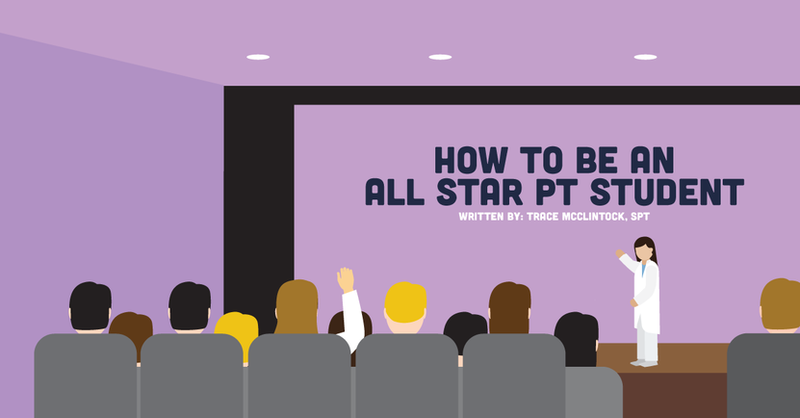 Here's how to crush it while you’re struggling through PT school and become an all-star when everyone else is just trying to stay in the game. How do you succeed in PT school? You have to be willing to apply, willing to fail, and willing to learn. It's all about the mindset. Just because you got accepted to school doesn’t mean your journey is over. To be honest, it is only beginning. Never lose the drive you had in your journey to PT school. Very few people got into PT school without knowing that they have a passion for helping others. Don’t get stagnant just because you get busy with anatomy or your ortho course. If your goal is to help patients and do more than draw a paycheck, make it a point to continue to educate yourself outside the classroom. Apply for scholarships to take some of the financial load off of you down the road. It amazes me how few applicants there are for some rather large scholarships. One of the ones I recently applied for had 29 applicants for 8 scholarships. Your odds were way less on getting into PT school, so why are you telling yourself that it isn’t worth it now? Getting into the mindset that you are good enough is something that I found rather challenging. Like many others in PT school, I got pulled off of a wait list and was only accepted into one school. That gave me the mindset of thinking that I wasn’t as smart as my classmates. However, you find out that while there are the select few that are setting the curve, the majority are right in line with your skillset. The thing that sets you apart from them is whether you are willing to do a little more. Also, as we move forward from students to clinicians, being willing to apply a treatment or intervention could be what begins your patient’s journey to a better life or improved outcome. If you are too afraid to even try an outcome or intervention, you will not be able to best serve your future patients. This portion is just as important as putting yourself out there. If you are in your second or third year and haven’t learned this lesson yet I would be very surprised. Everyone has an off test or practical. Everyone struggles. So why are so many students afraid of failing? I think what has set my experience apart is that I embrace failure in the classroom and while on internships because it is how you grow and develop. Many students think their professors expect them to be practicing clinicians after their first anatomy exam and that is just not the case. If you have a good clinical instructor (CI) they will challenge you daily but be there to support you if something goes astray. The profession of physical therapy is based on helping build up someone in a vulnerable position whether it is by helping our patients, or through our mentors and professors helping us. Find yourself a mentor who challenges you. The goal of a mentor is not to find someone who you get along with and who you adore, it is to find someone who sees your full potential and will do their best to make you your best. To relate this to clinical work, being willing to fail could be the difference between your patient walking for the first time since a major CVA and doing another three sets of 10 of ankle pumps. While keeping in mind patient safety, we need to be sure to challenge our patients to allow them the greatest chance to reach their functional goals. Just as in physical therapy school, these points build on each other. Those who are not willing to fail likely are not willing to apply. Learning is not just something that needs to occur in the classroom during your time in physical therapy school. You will likely be surrounded by the same people day-in and day-out for the next two to three years. If you want to crush it as a PT student, you have to expand your network. Join the Facebook groups that interest you, attend national conferences and keep connections from your clinical rotations alive. With so many amazing professionals in the field of physical therapy, you have the chance to learn about marketing, creating digital platforms, blogging, or podcasts. Of course the main goal of physical therapy school is to learn how to become the best clinician you can be; however, physical therapy is not a narrow field by any means. Even though you will be exhausted after a long semester, reach out to local clinicians to try and get more hands-on skills. Express interest in non-profits or other local charities in your area. The best way for you to learn the soft skills needed to be a high level physical therapist is by interacting with a wide variety of patient populations and finding the one that grabs at your heart. If you are sitting through PT school expecting someone to teach you how to have a conversation with a patient who recently had a limb amputated, I am sorry to say you will likely be disappointed. While it would be great if our programs could teach us every possible scenario, in clinic the only for sure answer is “it depends.” Getting exposure to how a variety of therapists practice and being willing to learn from them will set you up for long term success not only as a student, but as a future clinician. When it comes down to success as a student in physical therapy school, we all know that you will need to study and focus on the material being presented in your courses. However, if you dedicate a few hours each week to developing yourself as a professional you will set yourself up to be an all-star! Whether you just got into physical therapy school, or are staring the NPTE in the face, ask yourself: are you willing to apply to that job that seems out of reach? Are you afraid to fail because you would rather stay with treatments or situations you know? Finally, have you taken the time to truly learn from your experiences and reflected back on everything you have seen thus far? As a student the most important thing is to recognize that you have chosen an amazing career path and everyone who has PT, DPT after their name is willing to help you along your journey — if you are willing to ask.